Admittedly your experience of The Decline of Western Civilization will differ from that had by attendees of its spring 1981 Los Angeles premiere—a midnight show at the 1,200-seat Hollywood Boulevard theater, thronged by enough punks to pack the place to capacity and prompt a second sold-out screening at two in the morning, plus some 300 cops, whose boss later banned the movie from playing in L.A. ever again. Yes, you missed something by not being there. And that was only part one of (so far) three. 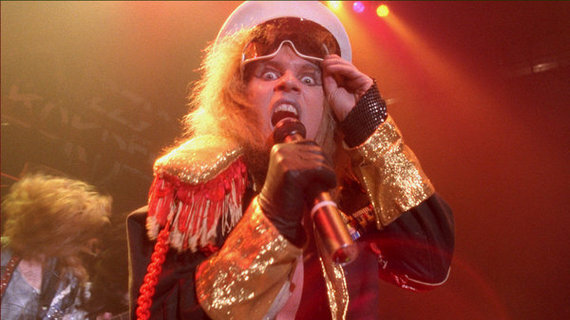 For a long while, 1988’s Part II, “The Metal Years,” could only be had by way of VHS bootleg. Then 1998’s Part III, a group portrait of homeless L.A. gutterpunks, was deemed too grim to get released. But such is the power of Penelope Spheeris’ landmark documentary series, which retrospect reveals to be her life’s work, that so far no amount of time or space or new movie-viewing technology can seem to dilute it. The Decline of Western Civilization has been happening for long enough now that you might even call it permanent. The nerves it touched still tend to throb. Spheeris wanted to get a good look at this. She had the great insight to recruit cinematographer Steve Conant, a shooter of Lakers games whose agility and alertness on the court would prove equally useful in the mosh pit. And she had the temperament to all but insist on her subjects’ humanity, even when on that front they appeared highly determined to thwart her. As a result, she achieved the just-right critical distance: a receptive, quasi-maternal skepticism which seems neither dubiously worshipful nor bogusly detached. That rapport gives the whole series its flavor, and its scope. “Punk was turning into disco in disguise,” says Alice Cooper early on in The Decline of Western Civilization II: The Metal Years, and Spheeris lets those fighting words stand. Here you can see why she’d had an offer to direct This Is Spinal Tap, and also why she turned it down: Outright ridicule was not on the agenda—not even with footage of a frazzled Ozzy Osbourne frying up a mess of a breakfast and also possibly himself, KISS frontman Paul Stanley gloating in bed with a handful of lingerie models, and W.A.S.P. guitarist Chris Holmes drowning himself with vodka in a pool while his mother watches. Unfazed by the bloated male chauvinism of fame-craving glam rockers, and daring to find some endearment in upstart metalheads’ mostly futile hope of one day making it, Spheeris stays true in her approach, which calmly defies even the most reactionary hate-watcher not to be wooed. Funny and riveting, Part II gets its power from an notion so generous that it does not even compute for die-hard fans: that punk bands and hair bands have common ground in the authority of the unselfconscious. The unvarnished bummer of the bunch, The Decline of Western Civilization III, pulls further back to reveal the legacy of that first punk generation to include a lost second generation. The cultural pendulum swings like a wrecking ball. You thought the disenfranchisement of the Reagan eighties was bad? Try the Clinton nineties! Not that Spheeris goes in for political broadsides. But while the empty excess of the L.A. metal scene may have been ridiculous, there’s arguably something even more troubling about tribes of homeless teenagers with spiky mohawks who make what little money they have by posing for photos with tourists. Having been cast out of routinely abusive or otherwise unstable households, these kids don’t expect to be famous in five years’ time; they expect to be dead. Along with lacking hope, they also lack self-pity. That they’ve kept their wits and maintained some tenderness, at least for each other, is a testament to spiritual fortitude. That they reveal such things to a camera is a testament to the filmmaker’s skill. Though Part III allows up front that several of its subjects hadn’t even been born during the time of Part I, it also contains an implicit understanding that the authentic quality of the former helped grant the access Spheeris needed for the latter: They knew who she was, and that they could trust her. Meanwhile former Black Flag and Circle Jerks singer Keith Morris returns to bemoan an uglier world, with “more people, more crime, more corruption, more reasons to be angry and upset.” And hasn’t every middle-aged person in history harbored the same complaint? It’s here that the series’ title takes on fully tragic proportions, neither a fusty finger-wagging lament nor a glib joke, but instead, at best, a weary and complicated sort of synthesis thereof. Well, that’s The Decline of Western Civilization for you: at once a bastion of anthropology, a black (hole) comedy, an oblique disaster movie, and, inescapably, one of the greatest rock ‘n’ roll chronicles ever recorded. You’d better be sure not to miss it.